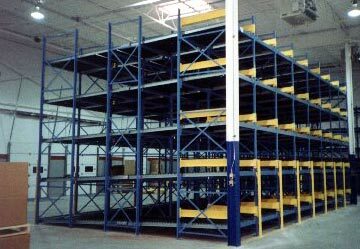 Selective rack is the most popular rack in warehouses today. It allows maximum flexibility in slotted design. This method provides 100% selectivity to every load. Loads are stored only one pallet deep which provides the lowest density storage in the range of pallet rack systems. Single deep rack is popular because it allows easy access to every pallet. Because of the variety of aisle configurations it allows the use of any type of lift truck. In addition, selective rack or single deep rack as it is also known is the least expensive rack system. Drive-in rack provides the option for high density pallet storage. For example, a drive-in rack system bay can be four pallets high and five deep holding 20 pallets in each bay. Lift trucks drive in the front of the bay, places the load in its position and backs out. Drive-in rack systems are designed without the normal cross beams to allow the lift truck access. The pallets sit on rails along the inside of the bays. The drive-in rack system is ideal for the “last in/first out” inventory. 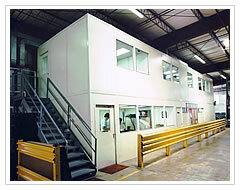 It is best utilized in a warehouse that is storing large quantities of identical product. Since drive-in rack limits access to products in the rear, the best utilization would be when the entire bay of product is being moved at the same time. Staging products for shipping is one example. 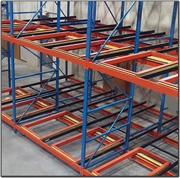 Push-back rack provides high density storage of pallets by combining a stationary rack with mobile trays that move along inclined rails. Push-back rack is load from the front. The first pallet is placed on the mobile tray when the second pallet is then loaded it pushes the first pallet back. Usually push-back rack is two to five pallets deep. It provides dense storage without the need of a lift truck to enter the rack and allows the option of storing multiple types of product in a single bay. A push-back rack system of storage provides a last-in/first-out inventory management. Pallet flow rack sometimes called gravity flow rack is a combination of a stationary rack system with a roller conveyor that creates a high density storage solution. Pallet flow rack is loaded from the back the pallet then travels down a slight incline of conveyor ready for retrieval from the front of the rack. The pallet flow rack allows for high density storage and more flexibility than drive-in or drive-through rack which is limited to single product storage per bay. 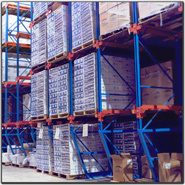 Pallet flow rack provides the ideal solution to warehouse that have a first-in/first-out inventory management system. It is great for the storage of dated products. You many use the pallet flow system for picking by the piece, the carton or the pallet.